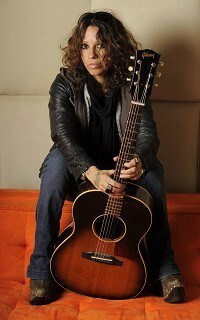 Linda Perry says she is still trying to get used to being an artist again. After spending more than a decade comfortably in the background as the uber-producer and songwriter behind hits for Pink, Christina Aguilera, Gwen Stefani and others, she's now fronting the duo Deep Dark Robot. And the 45-year-old is clearly relishing her second chance in front of the microphone. "I want to be an artist in this. What happens next year, I don't know, but this year, I want to focus on it because I need a break from the studio, I need to be outside," Linda said during a recent interview in a New York restaurant. Linda did have a taste of pop success as the leader of the '90s group 4 Non Blondes. But the group was a one-hit wonder, never duplicating the success of What's Up, and later disbanded. Linda then flirted with a solo career. But she truly flourished when a young singer named Alecia Moore - aka Pink - sought her out. "Alecia gave me like my big break. I was more interested in producing, not songwriting ... but I write music. I mean, that's just what I do," she said. Recently Linda started flirting with the idea of working in a band again. She came up with the name Deep Dark Robot and found a partner in Tony Tornay, drummer for Fatso Jetson. The creative spark for her new venture was unrequited love, Linda reveals, after she fell hard for a woman who wasn't gay. "It was very brief, but it was like an impact, this person, and she ended up being a muse for the record," Linda said. "So we called it 8 Songs About a Girl."